The very first Global Fatbike Day was last year, but I missed it because 1st December happened to be also 'Little Christmas' with my family. This year, the date was 7th December, hence no conflict with the Little Christmas. This year, MTB-Turku organized a GFBD group ride as the number of fatbikes in Turku area has increased significantly. My plan was to join in and do a long training ride in preparation for the Rovaniemi 150 race. The weather has been miserable here in South-Western Finland, but the first snow finally arrived on Friday/Saturday, just in time for the Fatbike Day! My route to Turku followed the nice scenery of Piikkiö and Hepojoki. I was slightly late so I joined the group at Katariinanlaakso. After a tricky duckboard section and some bushwhacking, we found our way to Vaarniemi shelter for a break for sausages. Before heading to next part of my training ride, I rode with Peter and Jarmo Järvinen (the other Finnish guy from last year's Rovaniemi 150). Riding in the darkness to Kimito Island, but the darkness is not an issue with the brilliant Lumicycle Explorers! Riding felt pretty good and I really loved the slight snowfall on my way to Kimito. The distance for the day was 117.34 km. But as I'm writing this, it's rather painful to see the current weather forecasts. The main reason for the mild weather is Arctic Oscillation that has been very positive, and the correlation with Southern Finland is pretty clear. 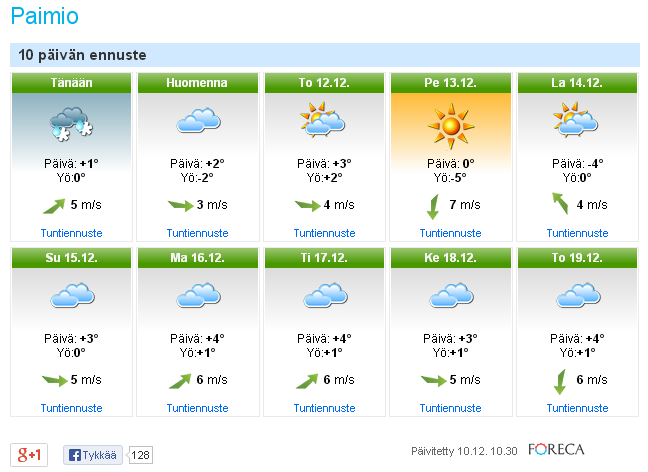 At the same time however, Lapland has very good winter conditions. For example, about 100 cm of snow and close to -40°C temperatures in Kilpisjärvi! Also, the AO forecast doesn't look good. The only hope is that these forecasts will fail somehow. Otherwise, two rather depressing weeks are in store here. What about the late December and rest of the winter, January-March? After a run of very good winters in 2009-2010, 2010-2011, the latter part of 2011-2012 and 2012-2013, I'm afraid of mild, slushy winter. But as always, it will be interesting to see how the winter will pan out.